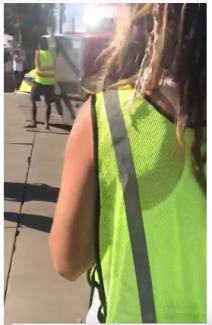 California animal rights protesters filmed the moment that they say a livestock hauler "hit" one of the demonstrators. The video was shared by the Facebook group Chino Cow Save on Aug. 21. It was filmed during a protest at American Beef Packers in Chino, Calif. In the video, you can see a demonstrator standing in the way of a truck trying to enter the facility. The truck makes contact with the man but he is clearly not injured. The video was captioned "Today at #WakeUpWorld Chino Cow Save an organizer was hit by a semi truck full of cows entering American Beef Packers to be slaughtered. Police are now on the scene." As pedestrians, we are allowed to cross the sidewalk and have the right of way when doing so. This has been discussed with the police and they concluded that we are in the parameters of the law to walk across the driveway while the truck waits for us to finish crossing. If you hit a pedestrian whether they are an activist or not you can be charged with assault with a deadly weapon or manslaughter. This is NOT a threat, we just want to make you aware of the risks in hitting a person with your semi. It takes us about 30 seconds to walk across the driveway. We are not trying to prevent you from doing your job or making your delivery. We only want a moment for others to bear witness to the beings inside the truck. Lastly, we are just there for the cows, we have no grievances with you. We understand you are just doing your job, we only want a few seconds (no longer than a stoplight) to share our love with the cows. Please feel free to message us with any comments or concerns. We would love to open up a dialogue with you." Chino Cow Save says that they'll be doing outreach at truck stops to try to educate drivers about their mission and to decrease the friction between the groups. See the video at https://www.facebook.com/ohhmelaniee/videos/10156241825526321/. "This should serve as a reminder to all meat companies to reach out to truckers and all plant employees about preparing for and reacting to activist protests in order to keep human safety and animal health a top priority," said Hannah Thompson-Weeman is vice president of communications for the Animal Agriculture Alliance in her blog Animal Ag Watch. "Everyone involved in the process of animal protein production, from farm to fork, is a target for animal rights activists. It is up to us to make sure every link in the chain understands the true intentions of these organizations and is prepared to handle their extreme tactics." Today at #WakeUpWorld Chino Cow Save an organizer was hit by a semi truck full of cows entering American Beef Packers to be slaughtered. Police are now on the scene.